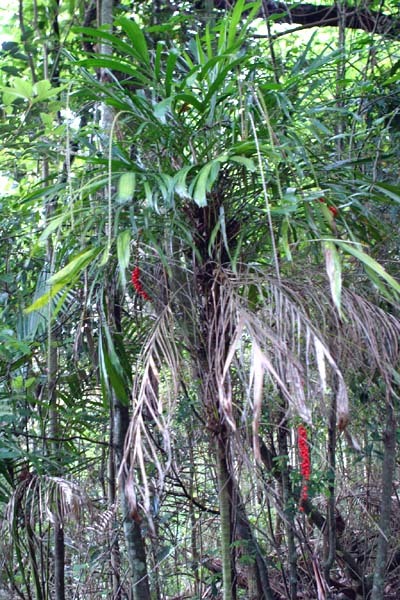 This native miniature palm is found as an understorey throughout the subtropical rainforest’s of Australia. Growth is very slow in it’s initial stages but very worthwhile to nurture as it is very attractive as an indoor plant. Orange fruits are edible. A 2m tall palm with a 2cm thick, ringed trunk. Grows long strings of red berries that hang in clusters from the top of the plant. Berries were eaten when clearly red in colour. The stem was used as a fishing rod. The bud of new shoots were eaten raw or cooked.